What is an Branded Career Page? Careers pages are powerful recruiting tools. Career page is simply a gateway to the world of potential candidates. According to a study, 2/3rd of the job seekers visit your website when they are interested in working with you. Why you need a career page? Reasons why employees work there. Reasons why employees choose to stay. A career site that is successfully implemented can effectively appeal to a lot of visitors which broadens the possibility of receiving more and more relevant applications from potential employees. However, building and maintaining a careers page can be a tedious task for SME’s because it requires a budget to build the career page & development resources. Recooty can certainly help you in creating a your company’s branded careers page within 5 minutes with zero coding required. Designing a careers page from scratch is one of the most tedious tasks when it comes to digital recruitment. It takes a lot of resources and most importantly, time to build an effective career page. Designing a branded careers page with Recooty is extremely simple, easy and hosted free on Recooty. The best part is, it doesn’t require any coding. It is as simple as changing your Instagram bio and profile picture. Recooty is not only famous for being the simplest and easiest Applicant Tracking System, but also for being the most affordable as-well-as efficient one. Designing a great careers page requires a lot of investment, from investing in building it, to maintaining it. But with Recooty, you just need to invest for once and we’re here to take care of everything you need to make your careers page look awesome so that you get one of the best hires. Recooty’s pricings are lowest than any other recruiting software. The best part is, not a single bit of the quality of awesomeness of the features that Recooty provides get compromised ever due to its affordable pricing. Save Time with Automated Job Listing Feature. When you already have a careers page and there’s a new vacancy open, in such a situation updating your careers page with the new job opening can be a really tedious and time-consuming task, especially if there’s more than one position. Also, when a position is filled and you need to deactivate a job opening can be really picky sometimes. It’s also a great threat in situations where you forget to deactivate the job post and there are still applications coming in, which disappoints the candidates. With Recooty, you simply needn’t worry about any of this. It simply automates the whole task of updating your careers page with new openings and remove the filled ones. It automatically updates the list of open roles every time you create or edit a position in Recooty. Improve Candidate Experience With an Organized Job Listing. An organized and systematic careers page is a great way to enhance the understanding about the job as-well-as your company for your potential employees. It can really impressed the candidates and effectively improve the candidate experience. Recooty careers pages are ideal for improving the candidate experience by providing the candidates a simple and effective understanding of their responsibilities and what is expected of them. When candidates visit your careers page, they view all your openings all at one place. They can choose within them which position interests them and when they click on it, they get a detailed description including responsibilities, required skills, experience required, location and employment type of the job. Finally, if they like the job, they can click on apply or they can click on the back which will direct them back to the list of openings. This simple 3-click process can help candidates get a greater sense of their responsibilities and relate more to the job. Identify The Best Fit Effectively. Having an ATS surely reduces the hassle of streamlining the job applications. But wouldn’t it be great if somehow the received applications and the job requirements can be compared and based on that comparison it could be determined if the candidate is best for the job or not? It would make hiring a lot easier. With Recooty’s Careers Page, this can be done very easily. 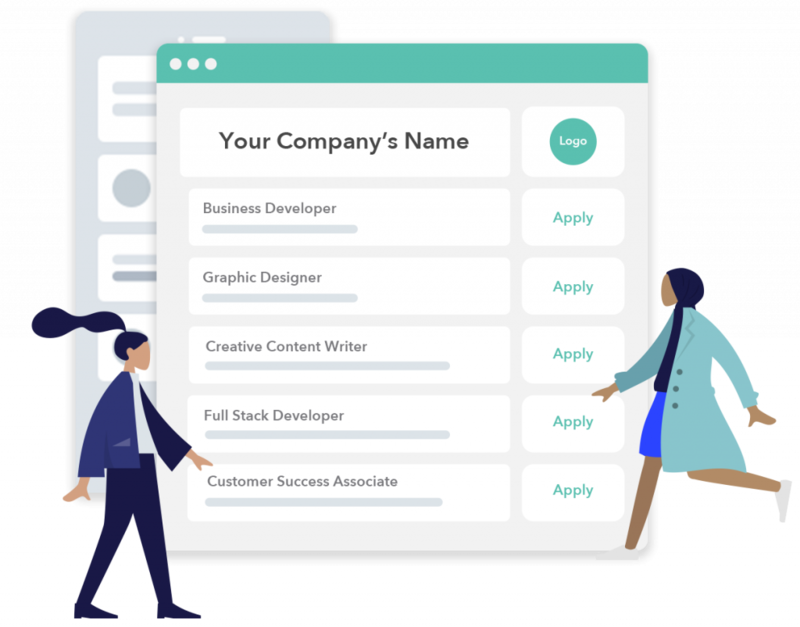 The candidate rating feature of Recooty effectively compares the keywords and skills of a candidate’s application and the requirements of the job and based on that rates the candidates in the form of a colored bar. The most relevant applications have a full green bar, moderately relevant applications have an orangish color, half filled bar, and least relevant applications have a red colored, almost empty bar. This feature can instantly evaluate an application and help in hiring the best fit. Expand Your Reach with Google For Jobs Integration. Wouldn’t it be great if your a position of your company’s careers page pops up on Google Job Board whenever a talented candidate searches for it? With Recooty, you can achieve this effectively. Recooty is integrated with Google Job Board. This means that whenever you publish a job on your Careers Page using Recooty, it will also be visible on Google Job Board, giving your job opening the maximum reach to attract great talents. careers page with Recooty today! © , made with by Team Recooty.